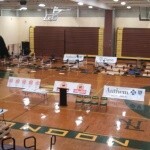 On March 9, 2019, the ShopRite Nutmeg State Games hosted the 6th Annual High School Football Weight Lifting Competition presented by the Connecticut National Guard at New Britain High School. Congratulations to all of the twenty-six teams that participated. Southington High School came in 1st Place with a total of 13,130 lbs lifted! Participants must be in the 9th, 10th, or 11th Grades. 2019 Graduating Seniors will not be allowed to participate. It will be the responsibility of the coaches to spot and make sure their lifters have a safe weight on the bar. Touch and go format…The bar must touch the chest in a controlled manner. No bouncing the bar off the chest, and the hips must remain on the bench at all times. Each lifter will get 3 attempts at a 1 Repetition press. Spotter/coach can help with the lift off. However, if spotter touches the bar at any time during the motion the lift is NO good. Lifter must lock out arms/triceps in full to be a good lift and show control of the bar. If an attempt is failed, lifter cannot reduce the weight on the bar. No gloves, smelling salts or bench press lifting shirts will be allowed. Lifter must perform movement using one continuous motion from the floor to the upper chest/body. Each Lifter will get 3 attempts at a 1 rep max. If an attempt fails, no lift can be performed from a hang clean/waist up position. Lifter must show control of the bar at the completion of the lift. Lifter must follow the bar to the floor after the attempt in order to keep a safe environment. No gloves, smelling salts, or wrist straps will be allowed. Spectators will NOT be allowed in the Squat room - ONLY participating athletes! Judge will look for the top of the quadriceps to be parallel. Example to go by: if we put a tennis ball on the middle of the Quad it won’t roll to the knee or hip. Judge will tell lifter if attempt is GOOD or NO GOOD when athlete is parallel...Lifter may repeat weight again if he/she is not parallel. Lifter MUST be parallel and maintain control of the bar. Lifter must rack the weight. Knee wraps will be allowed. No smelling salts will be allowed. ONE CHECK covering the entire team entry fee(s). Please make the check payable to the CT Sports Management Group, Inc.
- All Payments & Rosters are DUE! One team per school only. Varsity teams only. No JV teams. - All Team Payments must be paid in full. You have the option of register online or by hardcopy. You do not have to do both!